With Parlando Italiano you can choose between face-to-face Italian lessons at your home in London and Italian lessons via Skype. Lessons are very flexible, we work every day from 9am to 9pm, and through our user-friendly online platform you will be able to schedule all your classes at your own convenience. All our teachers are fully qualified native Italian speakers and have a broad range of experience teaching Italian to students at all levels (Beginners to Advanced). Lessons will be totally personalised depending on your Italian level and individual needs. So, whatever your reason for learning Italian is (business, exam preparation, travel, etc. ), just let us know and we will be very happy to design the best course for you. The first face-to-face lesson has a 15% discount. If you live in London and are interested in this type of lessons, we will look for an Italian tutor in your area. 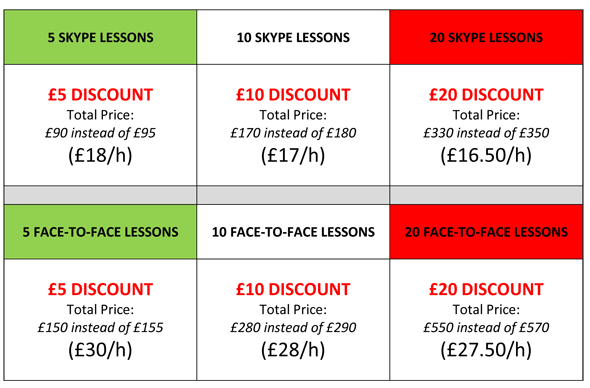 And, if you have never studied a foreign language online and want to see by yourself how our lessons work, remember that the first Italian lesson via Skype is totally free! So, don’t hesitate anymore, contact us to discover more about our Black Friday Special Offer and start learning Italian with Parlando Italiano today! This entry was posted in Offers and tagged Black Friday, Special offers by myitalianlessons. Bookmark the permalink.